I’m really glad I didn’t make this one the same week as the chicken pot pie. 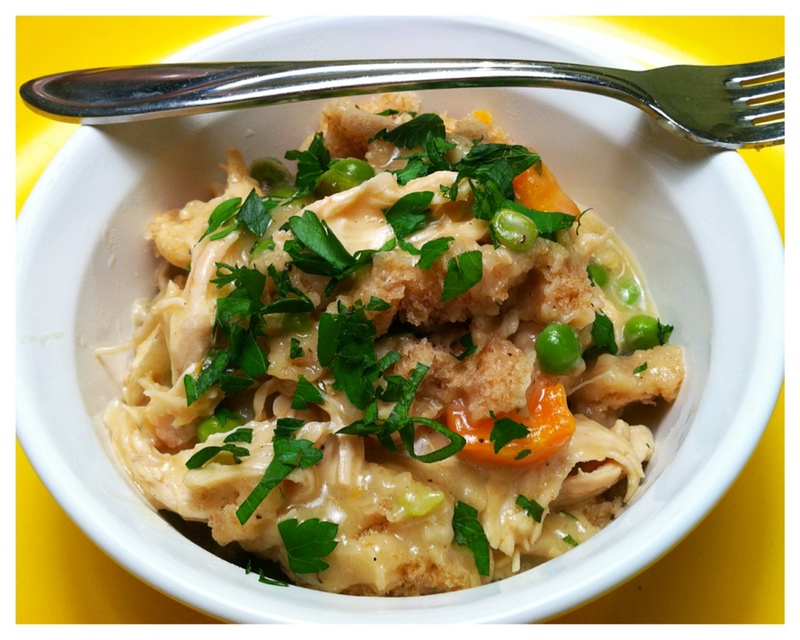 Well, chicken and dumplings is, essentially, a deconstructed chicken pot pie. Personally, based on the way each dish turned out, I’d rather have the pot pie. I’m not saying this one was bad, it just wasn’t as good as the pot pie. Again, I’m not really sure who (or what) is to blame here, but since I’m not in the business of bad-mouthing other hardworking food bloggers, I’ll take the fall on this one. Besides, this recipe came from Diane at Stylish Cuisine and her finished product looked all sorts of warm, happy and saucy. I halved this recipe, but I halved everything, including the stew/sauce. I assumed that was the right way to do it, but were I to make this again, I would probably keep the full amount of sauce and halve just the actual chicken and dumplings. Somehow, despite cooking in liquid, my chicken also came out a bit tough and seemingly overdone, although I’m alone in this consensus. No one else that ate it seemed to agree; maybe it’s just my oversensitive, wisdom-toothless mouth talking. Regardless, this wasn’t bad–I ate it for lunch the next day–but it wasn’t the comfy-cozy comfort food greatness it could have been. And yes, I am comparing it to the pot pie, which probably isn’t fair. It should stand on its own merit. But I can’t help it, they’re practically the same dish. I even “healthified” the dumplings a bit by making them with half whole-wheat and half all purpose flour, like the pot pie crust. I’m sorry (but not really) for turning chicken and dumplings into the shadow-cast little sister of chicken pot pie.